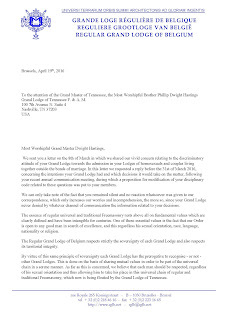 On March 8th, the Regular Grand Lodge of Belgium suspended fraternal relations with the Grand Lodge of Georgia over their recent addition of language to their Code forbidding homosexuals from joining Masonry in that state. 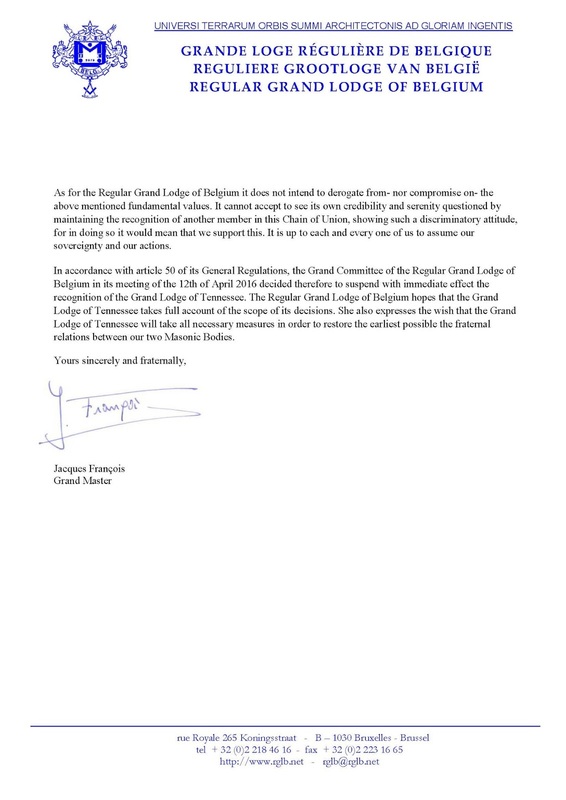 Today, the RGL of Belgium's Grand Master, Jacques François has now followed through with his promise to do the same with the Grand Lodge of Tennessee if they failed to pass a resolution to remove similar discrimination from their own Code at their Annual Communication last month. As previously reported, Belgium now joins grand lodges in California and Washington D.C. in dropping recognition of Georgia and Tennessee. Belgium understands what freemasonry is all about. It is not enough to deplore racism and gay bashing as some grand lodges have done, but to do something about it. Belgium and California and Washington DC have provided moral leadership. Now what of the other grand lodges. I think that treating people equally regardless of race or gender is a matter of decency, is what we pledge by using the word "all" in saluting the flag, and basic to masonry. The question for Masons worldwide is this: are these entirely unnecessary statutes worth splitting Masonry asunder? I think not. Dave, I agree. But I completely understand the Masons who believe they are increasingly surrounded by a world gone mad, and that they are trying in their own way to make it stop. The societal attitude towards gay people in the US (and the rest of the world, as well) has changed dramatically in the last 8 years - seemingly overnight. Discrimination against them is seen as repugnant as racial bias by the overwhelming majority of the public. But that was not true less than a decade ago. So, I am not unsympathetic to these brethren who see homosexuality as a moral failing - that's how they were taught their entire lives. California and DC have borne the brunt of the initial public criticism by being protested against and being dis-invited from cornerstone ceremonies, because of GA and TN's actions. They also have members who are openly gay, who have never been objected to inside or outside of their jurisdictions, who were suddenly confronted with this issue. So, I can also understand GL jurisdictions that withdraw relations with those states because such rules are insulting to their members, and not in keeping with the letter or spirit of the Ancient Charges. Before this is all over, I suspect the actions of the RGL of Belgium, CA, and DC will not be repeated, unless UGLE does so - then look for a flood. But at best, I believe this will do little to influence these two jurisdictions. But it might convince other GLs not to follow GA or TN's lead on this issue. Brother Dave, we are already split. If you are African American you arent welcome in many southern lodges. If you are a Jew, you know some grand lodges dont initiate Jews and that goes as well for some Scottish Rite bodies. As a black, gay, or Jew you are a second class If you are gay, you know that gays have been kicked out by some grand lodges when they get married. If you are an African living in exile you know that grand lodges in some countries are apparatus of the dictatorship and secret police, but recognized by American lodges. And so on. Of course masonry is split. Its more split now than ever, between decent masons and bigots. Freemasonry has to be progressive so as to prosper and survive. For those GLs, Ls and members unable to move forward and accept that society is made of heterosexual and homosexual peoeople. To think otherwise is naive in the extreme and judging them negatively is bigotry. If certain Lodges hang on to outdated and socially repugnant discrimination towards gay men then they will fail as new membership dries up and the Masonic world removes recognition entirely. Suspect it only a matter of time before UGLE withdraws recognition. The problem is that GLs do not (at least don't anymore) have official language in their codes regarding racial discrimination. It's done at the local lodge level, instead of being institutionalized. 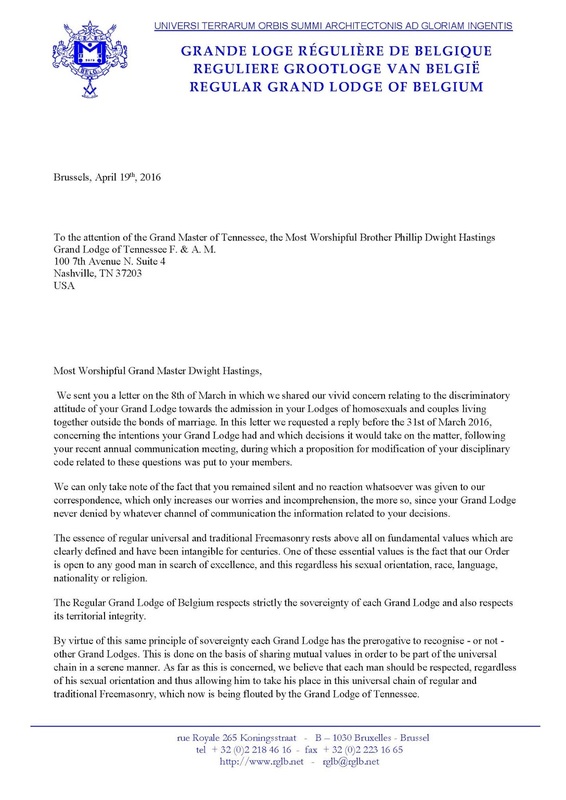 The most recent high visibility case was in Georgia in 2009, when a lodge in Atlanta initiated, passed, and raised a black member. Two WMs from other lodges brought charges against the entire lodge for violating the "Moral Law." It took relentless public outrage by Masons and the press (including the NY Times), as well as a civil lawsuit, before the sitting GM ordered the charges to be dropped. Any Mason has the right to drop a black cube against a petitioner for any reason, without disclosing his vote or reasons. In fact, in many states, it is a violation of the Code to even discuss a vote, before or after it is taken. But as far as I know, all petitions in the US are colorblind, as are requirements for initiation. In most states these days, there are handfuls of black "mainstream" Masons, even in the South (largely in the bigger cities). That number will grow over time. But be aware that more PHA Masons live in the Southern states than in the rest of the US combined. It's very strong there, and many of those PHA GLs don't want to even discuss joint recognition - much less, visitation.